The 3-point base together with the special floating bearing principle and beam design eliminates the need to have a level adjustment. Zeroing is easily and quickly achieved by means of a counter balancing knob at the end of the beam. 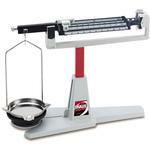 The balances are intended for use in education, and industry applications. Ohaus Dial-O-Gram� Balance Model 310 and Cent-O-Gram� Balance Model 311 are manufactured from high grade precision zinc castings for the base and precision aluminum castings for the beam. Agate bearings, hardened steel knife edges, and stainless steel pans ensure a high standard of quality for these products. The 3-point base together with the special floating bearing principle and beam design eliminates the need to have a level adjustment. Zeroing is easily and quickly achieved by means of a counter balancing knob at the end of the beam. 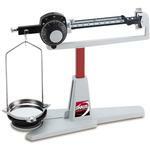 The balances are intended for use in education, and industry applications. They produce quick readings due to their damping mechanism. Both balances can also be used to make specific gravity measurements. Model 310 has two beams, each with a sliding poise, and a graduated dial and vernier which enables readings of 0.01 g. Capacity of the Model 310 is 310 grams. Model 311 has four beams, each with a sliding poise. Capacity of the Model 311 is 311 grams with a readability of 0.01 g.
Rugged and durable, yet economically priced.